Not unlike Dubonnet but with a lighter palate - the classic bitter aperitif. Campari is a distinctive bitter alcoholic liqueur, with a brilliant red colour and a blend of herbs and spices that creates a unique taste. It is traditionally served with soda water, ice and a slice of orange, although it is also a very popular ingredient for many cocktails (The Negroni and The Americano among them). Campari was created by Italian master drink maker Gaspere Campari in the 1840s during a period of experimentation. The recipe (still a closely guarded secret) includes a blend of herbs, aromatic plants and fruit in neutral alcohol and water. What Campari created was an intense aperitif with a unique scent and spirit that quickly became intensely popular across Italy. 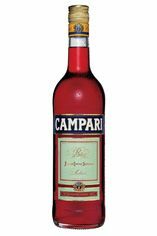 By the 1920s Campari had come to signify Italian spirit personified across the world with its red passion, depth of taste and stylish fashion. Throughout the 20th and 21st centuries Campari has been closely associated with many different cutting-edge artists and an art-deco glamorous style. But Campari is also celebrated as a drink of choice amongst true beverage aficionados who revere the complex medley of herbal flavours that stay on the tongue long after the final sip.